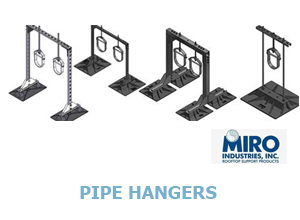 Miro Industries Products | Mason-Dallas Inc.
Mason-Dallas is proud to offer Miro Products. 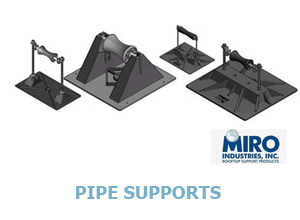 MIRO Industries, Inc. specializes in pre-manufactured rooftop supports for pipe, conduit, duct, mechanical supports, bridge crossovers, walkways, service platforms and ramps. Pipe Supports roller-bearing pipe support used to support roof-mounted gas pipes, electrical conduit, solar piping and other mechanical piping. Unique design absorbs thermal expansion and contraction of pipes thus preventing damage to the roof membrane. Pipes rest on a self-lubricating polycarbonate resin roller rod and roller. Pipe Hangers pipe support, used to support roof-mounted gas pipes, HVAC piping, electrical conduit, solar piping and other mechanical piping. Unique design absorbs thermal expansion and contraction of pipes thus preventing damage to the roof membrane. Conduit Supports pipe support, used to support roof-mounted gas pipes, HVAC piping, electrical conduit, solar piping and other mechanical piping. Unique design absorbs thermal expansion and contraction of pipes thus preventing damage to the roof membrane. 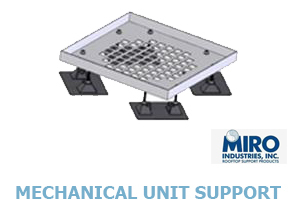 Mechanical Unit Supports are supports to elevate rooftop mechanical units such as air conditioning or other devices. 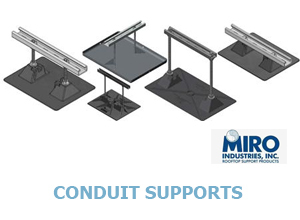 The Mechanical Unit Supports are designed so that the mechanical units rest in heavy-duty corner or side supports which are connected to bases designed with MIRO technology to protect the roof membrane. 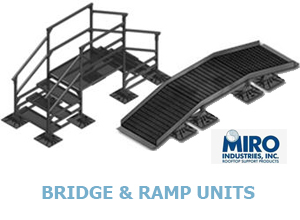 Bridge & Ramp Units are designed to provide access over piping, duct, equipment, or high or lower areas of a roof surface.